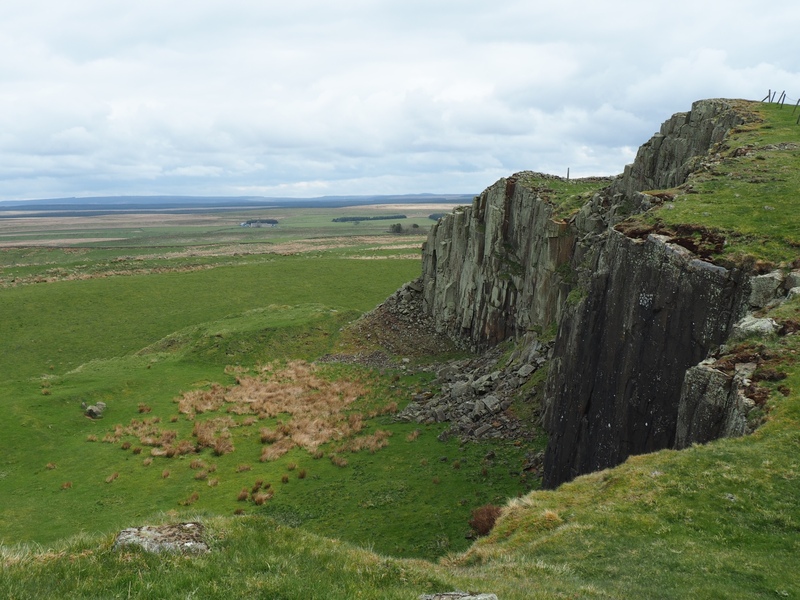 A short but enjoyable walk visiting the dramatic Walltown Crags section of Hadrian’s Wall. This walk was the first of a series of Roman-themed activities I had planned for the Bank Holiday weekend whilst camping with my wife and daughter at the nearby Herding Hill campsite. It was also the first stretch of the wall that I’ve visited away from the section between Winshield Crags and Sewingshield Crags further east. The walk started from the large National Park car park just up the road from the Roman Army Museum. From the car park we set off north along the quiet road leading to the scattered farms of Low Old Shields, High Old Shields, Low Tipalt and Farlow. Just past High Old Shields and Collar Heugh Crag we took a path, reedy in places, heading south-east to arrive on the Wall between Mucklebank Crags and Walltown Crags. Having told Rhiannon all about Hadrian’s Wall it was something of a disappointment to find that there was barely any evidence of the wall at all over the first part of Walltown Crags. The views from the crag were excellent but I did begin to worry that after the big build up there wouldn’t be any decent surviving portion of the wall at all on this route. My worries were allayed though when we contoured above a quarried section of the crag to the western half of Walltown Crags where there was a decent section of wall and the remains of Turret 45a. Taking the perspective of a Roman soldier it is hard not to focus on the view north of the wall but it is definitely worth considering the view south as well where there was a fine prospect along the South Tyne valley with Grey Nag and even Cross Fell well seen. Continuing on we dropped down below some particularly dark exposed Whin Sill crag and made our way to the benches next to what is either a small lough or a quarry pool for a picnic and some stone skimming practice before returning to the car. Sadly, due to deteriorating weather later in the day and a poor forecast for the Sunday, we cut the trip short that evening. Thankfully we did at least manage this nice little excursion and also a visit to the nearby Roman Army Museum which I would strongly recommend.